Christmas dinner is the time to share memories and make new ones and Christmas appetizers are a tasty way to get the dinner started. Red and green are the colors of Christmas, so it only makes sense that Christmas appetizers should be red and green. This doesn't mean you're stuck using only those colors, but anytime you can sneak them in it is sure to be noticed. Red and green salsa served on the same platter is a fun way to start everyone's appetites and it's a festive way to serve chips, but other dips are just as seasonal and tasty. Eggplant is in season in the winter months and makes a delicious appetizer. The secret behind making perfect babaganoush is to not overcook the eggplant. You'll know your eggplant is done when it is soft to the touch and the skin is wrinkled. Poke holes in the eggplants using the tip of a paring knife. Place the eggplants on a cookie sheet lined with parchment paper. Bake the eggplants for 45 minutes. When the eggplants are cool to the touch, peel them and place them into a colander in your sink or place in a large bowl. Cut the eggplant, while they are still in the colander, into small cubes. Mash the eggplant with a fork, squeezing out as much juice as possible. Place the mashed eggplant in a bowl with the rest of the ingredients. Beat using a whisk until smooth. Artichokes are another seasonal vegetable that makes a great dip. If you like, you can marinate your own artichoke hearts but buying pre-marinated artichoke hearts can save you time. Place everything but the artichoke hearts into your food processor. Add the artichoke hearts and pulse until combined. Place the dip into a 9x9 baking dish and bake for 30 minutes. A salad is a great way to add some bright flavors and colors to your table. Caprese salad is perfect as a Christmas appetizer because it is naturally red and green. Traditionally, plum or Roma tomatoes are used for this salad but if you can find ripe heirloom tomatoes, I suggest using them since they have a richer flavor. When shopping for the mozzarella for this recipe, look for mozzarella di bufala, which is made with milk from the domestic water buffalo. Slice the tomatoes into ¼ inch thick slices. Slice the mozzarella into ¼ inch thick slices. Wash the basil and remove the leaves. 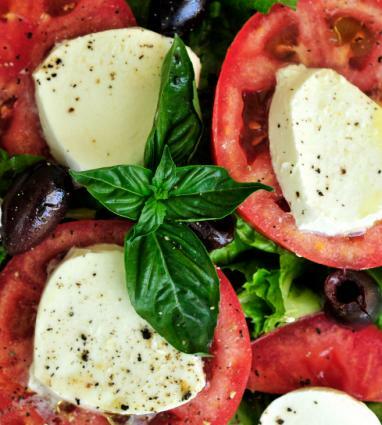 Arrange the tomato, mozzarella, and basil leaves in an alternating pattern on a plate. Salt and pepper the salad. For a change of flavor, you can drizzle balsamic vinegar on the salad as well. These tasty little crackers are not necessarily associated with Christmas, but they are great Christmas appetizers. Put the butter, flour, cheese, anchovies, olives, and cayenne pepper into your food processor and pulse until a dough forms. Wrap the dough in plastic wrap and refrigerate for 30 minutes. Roll the dough out on a floured surface to ¼ inch thick. Cut the dough into 2-inch wide strips. Cut the strips into triangles. Place on a baking sheet that has a sheet of parchment paper on it. Sprinkle with sea salt before they cool.